I hope this email finds you well this Thanksgiving Day – and with family and friends. It’s a great time to reflect on what’s important in life. For my part, I am deeply grateful for the opportunity to make a difference in the financial lives of my customers and readers. 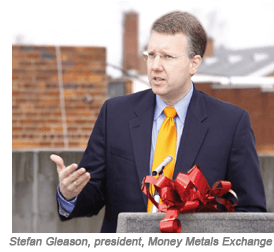 Leading Money Metals Exchange to new heights is fulfilling work, particularly working with my extremely capable business partners Mike Gleason and Clint Siegner and our staff of 25 dedicated employees. It’s been a tough couple years for investors in the precious metals market with a shorter-term horizon, but I am quite optimistic. You should be too. Money Metals Exchange is having its best year of new customer growth because a growing number of Americans are waking up and taking action to protect themselves from the effects of the politicians’ irresponsible borrowing and spending, Washington’s out-of-control bureaucracy, and Wall Street’s self-serving bankers and financial elite. More folks than ever are voting with their money by accumulating gold and silver – taking meaningful steps to diversify away from the unstable dollar the steady erosion of their savings and purchasing power. There are now more than 35,000 Americans who purchase their precious metals from Money Metals Exchange! Of those, more than 3,000 individuals are saving in real assets every single month, through our monthly gold and silver savings plan. More customers than ever have been jumping on the opportunity presented this year to add to their positions (or make their first purchases) while gold and silver are on sale at what appears to be unsustainable, ridiculously low prices. Our customers are taking decisive action, and we are honored to help them. We don’t have a crystal ball, but we do constantly recheck our premises behind the case for diversifying into gold and silver. The case is stronger than ever. Our recent articles and podcasts lay it all out, and I hope you’ve been taking advantage of the high-quality content we produce each week to keep you informed. Thank you for allowing us to play a small role in your life this year. We take that responsibility extremely seriously.